Applications are now open for the 2019 Military Zone. Please click here to enter a military vehicle online or here to enter a re-enactment group. Applications close 3rd May 2019. Attracting crowds of over 25,000 in 2018 and with over 32 acres of arena space to accommodate a diverse range of exhibitors, Wings & Wheels has a variety of opportunities to suit your business. 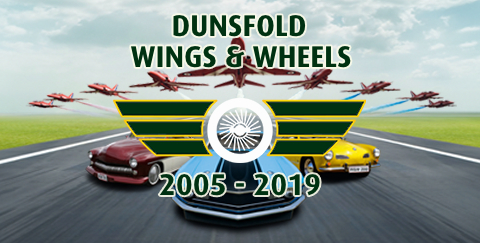 The exhibitor pack will give you more information about the show, exhibitor opportunities and options as well as information on the Show's audience profile and media coverage, which will help you to decide if Wings & Wheels is right for you. Trade applications for 2019 are now open. Please click here to download an application form. To contact the team with any questions please click here. Entries for the 2019 Wheels Zone & Grass Parade are now CLOSED. Wings & Wheels offers car and motorbike owners the opportunity to display their beautiful machines in the Show Arena. We are looking for supercars, classic cars, American gas guzzlers, hot rods, alternative cars, street bikes, superbikes, classic bikes or alternative bikes. Not only will you be able to display your pride and joy, but you also get the benefit of heavily discounted ticket prices. We provide clubs with a 20m x 20m pitch, which we encourage you to have fun with and make the most imaginative and creative display with your vehicles and decorations. Club memorabilia, banners and posters are welcome. Awards will be made for the best club stand over the weekend with solo awards also available for the best vehicles on display. Not part of a club? Then do not worry, you can still attend as a Solo entry, you will be positioned with like-minded solo entries, and you are also in with a chance to win a prize! There is also the opportunity to participate in or 1.5km crowd line grass parade which is a cavalcade of the best vehicles in the Wheels Zone. Please note that cars require a 6-inch ground clearance as the parade is on grass. NB. This is not the application for the Motoring Demonstration on the Runway. Entries for the 2019 Motoring Demonstration are now open. Click here to enter. The Motoring Demonstration brings together Supercars, Race Cars, Rally Cars, Motorbikes and Pre-War machines that spit fire. They are all given the chance to thunder up the runway, testing their power and straight-line speed, before turning and heading back for a second run via the famous Top Gear Test Track. Would your vehicle make a spectacular addition to the line-up at Wings & Wheels? If you answered yes to any of the above then please complete the online application form*. All participants will have to be wearing an appropriate Motorsport helmet. As you can appreciate the Motoring Demonstration takes a lot of time and effort to organise, particularly as Health and Safety regulations have become tighter, and this, coupled with an increasing number of 'no show' applications, means we introduced an entry fee. *Please note that priority will be given to vehicles that we deem suitable, and will add to the spectacle of the runway demonstrations. If the event is oversubscribed; we reserve the right to pick and choose. **Subject to circumstances that could result in the closure of the runway.